Not to be confused with Pennsylvania Line Mutiny. 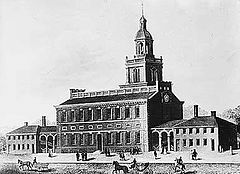 From March 1781, the Congress of the Confederation and the Supreme Executive Council of the Commonwealth of Pennsylvania were situated at the Pennsylvania State House (now known as Independence Hall) in Philadelphia. Under the authority of the Articles of Confederation, Congress did not have direct control over the military, except in times of war, and was largely reliant on the use of state militias to enforce laws and keep order. The next morning on June 20, the State House was mobbed by as many as 400 soldiers demanding payment. The soldiers blocked the door and initially refused to allow the delegates to leave. Alexander Hamilton, then a delegate from New York, persuaded the soldiers to allow Congress to meet later to address their concerns. The soldiers did allow the members of Congress to peacefully adjourn that afternoon. That evening, a small Congressional committee, headed by Hamilton, met in secret to draft a message to the Pennsylvania Council, asking them to protect Congress from the mutineers. The letter threatened that Congress would be forced to move elsewhere if the Council did not act. On June 21, the Congressional committee met again at the State House with members of the Pennsylvania Executive Council, including its president, John Dickinson. The members of Congress asked the council to do more to protect the federal government. Dickinson and the council agreed to consult with the militia commanders and reply to Congress the next day. The following morning, the Pennsylvania Council again refused Congress' request. Lacking sufficient assurances that the state would be willing to protect Congress, the members left Philadelphia that day for Princeton, New Jersey. George Washington, on hearing of the mutiny on the 24th June, sent 1500 troops under the command of Major General William Heath and General Robert Howe, who came out of retirement, to suppress the mutiny. Some of the mutineers ended up in a state of arrest, and Congress called an investigation into the event. John Dickinson, President of the Executive Council of Pennsylvania. There are three reasons put forth as to why Dickinson and the Pennsylvania Council did not act. The Council's official reasoning was that they were unsure that the local militiamen would actually protect Congress from their fellow soldiers. Further, the council may have thought that the conflict was not as serious as Congress believed and that the mutiny could be resolved peacefully. The second theory put forth is that Dickinson, having been an officer in the militia, was sympathetic to the soldiers' grievances. The third theory is that the Council refused to allow Pennsylvania, a sovereign state, to be subjugated by the demands of a few members of Congress. After Congress completed its business at Princeton in early November 1783, the capital was moved later that month to Annapolis, Maryland, then to Trenton, New Jersey in November 1784, and finally to New York City in January 1785. It was not until the Constitutional Convention in 1787 that delegates decided to meet again in Philadelphia. Pennsylvania's failure to protect United States institutions, was a primary reason why the framers of the Constitution decided to create a federal district, distinct from the states, where Congress could provide for its own security. The delegates therefore agreed in Article One, Section 8, of the United States Constitution to give the Congress the power "to exercise exclusive legislation in all cases whatsoever, over such District (not exceeding ten miles square) as may, by cession of particular states, and the acceptance of Congress, become the seat of the government of the United States". Following the ratification of the United States Constitution by the state of New York in 1788, the delegates agreed to keep New York City as the temporary federal capital. In 1790, Congress passed the Residence Act, which created the District of Columbia, located on the banks of the Potomac River from land belonging until that time to the states of Maryland and Virginia, to serve as the new federal capital. Robert Morris, a representative from Pennsylvania, convinced Congress to return to Philadelphia while the new permanent capital was being built. As a result, the Residence Act also declared Philadelphia to be the temporary capital for a period of 10 years. In a final attempt to convince Congress to keep the capital in Philadelphia, the city began construction on a new Presidential palace and an expansion to Congress Hall. Their efforts failed, and the federal government relocated from Philadelphia for the final time on May 14, 1800. ^ McLaughlin, Andrew (1936). A Constitutional History of the United States. New York: D. Appleton-Century Company. ISBN 978-1-931313-31-5. ^ a b c d e Flexner, James Thomas (1997). The Young Hamilton. New York: Fordham University Press. pp. 417–25. ISBN 978-0-8232-1790-8. ^ a b c Powe, Lucas (1992). The Fourth Estate and the Constitution. Berkeley, California: University of California Press. p. 31. ISBN 978-0-520-08038-6. ^ "Congress Flees to Princeton 1783". ^ Crew, Harvey W.; William Bensing Webb; John Wooldridge (1892). Centennial History of the City of Washington, D. C. Dayton, Ohio: United Brethren Publishing House. p. 66. "...Congress then sitting in Philadelphia was threatened by a mob of dissatisfied soldiers. This event took place in June, 1783, and was the cause of great excitement and controversy. Its importance in the history of the country is great, for from it may be dated the first decided intimation of a fixed and permanent seat of government; in other words, the necessity of a National Capital City, under the sole and exclusive control of the Congress, and independent of all State government and influence." ^ a b "The President's House in Philadelphia". Independence Hall Association. July 4, 1995. Archived from the original on July 15, 2007. Retrieved August 27, 2008. ^ "Residence Act: Primary Documents in American History". Library of Congress. September 21, 2007. Retrieved June 10, 2008. ^ "The Nine Capitals of the United States". United States Senate. Retrieved September 7, 2008. Hamilton, Alexander; Henry Cabot Lodge (1904). Complete Works. New York: G.P. Putnam's Sons. Nagy, John A. Rebellion in the Ranks: Mutinies of the American Revolution. 2007. ISBN 978-1594160554. Webster, Noah (1832). History of the United States. New York: Wilcox & Dickerman Company.